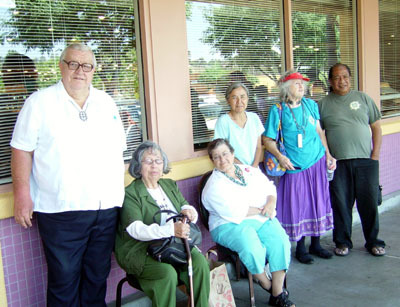 TONKAWA Council of Elders and their guests met for lunch at the Home Town Buffet, HTB, on University Ave. August 13, 2009. TONKAWA President Violet Tunohun and Jean Vigenault, TONKAWA Treasurer met early outside the HTB to greet those early and later attendees. It is a bright comfortable afternoon for some casual socializing. Occasionally, you have no doubt experienced this; we see someone, recognize the face and a flood of associated memories gush forth spontaneously. Time evaporates as the years drop off and very often conversations are resumed in astonishing detail that, if called upon by demand, we could not recall a single detail. There was a lot of that on this special afternoon. 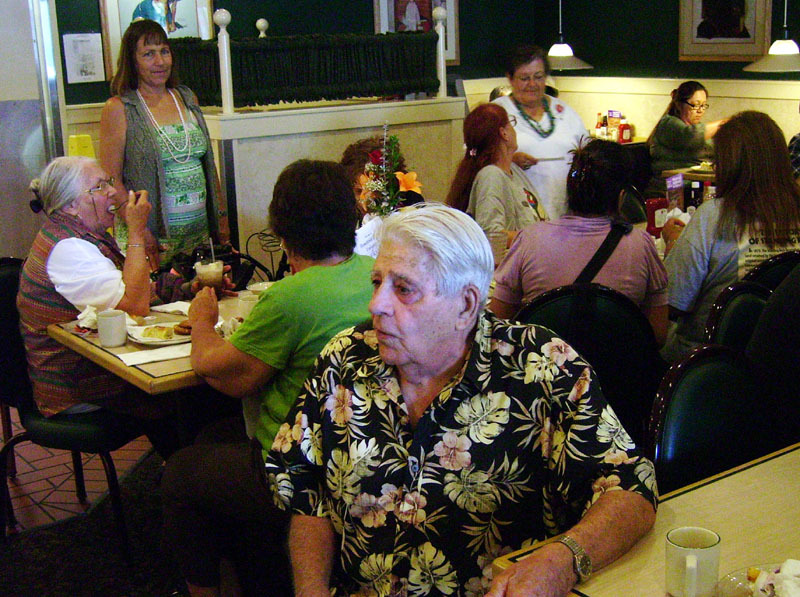 Past TONKAWA members, community board members of other organizations, semi and full time employees, and all made time to attend this TONKAWA function. 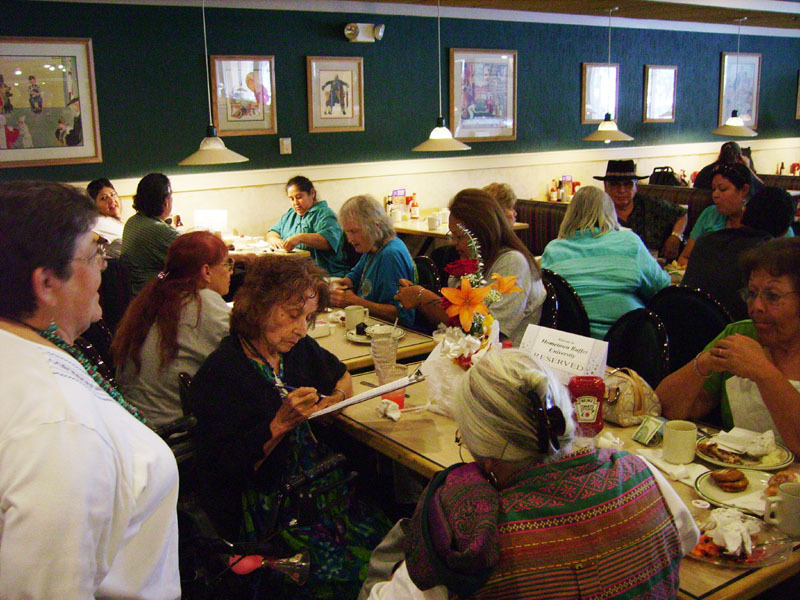 Of special note is Mrs. Jane Dumas, a charter member of TONKAWA and a special honored elder of our local Kumeyaay people. 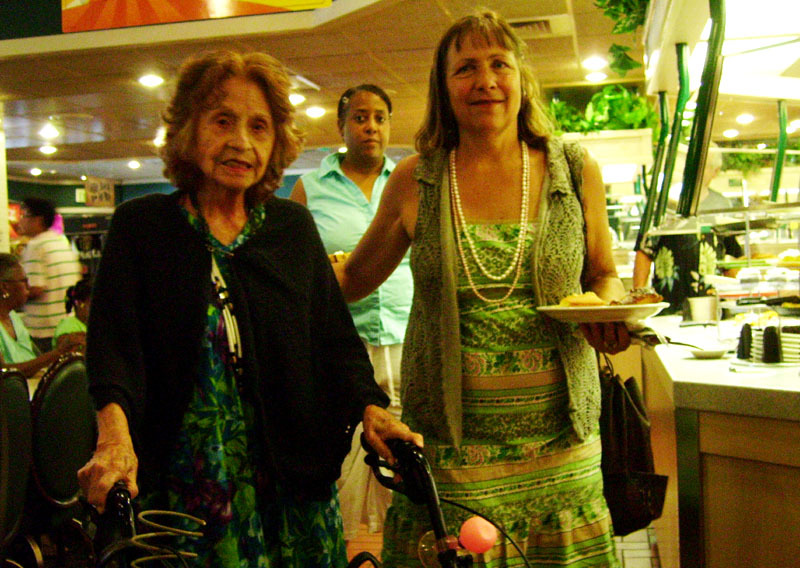 She is getting around better and with a little help from Teresa Mills was actively participating and enjoying seeing friends again. We were also very pleased to see our long time friend Joe Renteria and his wife enjoy the TONKAWA luncheon this afternoon. It just makes your heart feel good to see a loving couple care for each other in this way. There is always a fine selection of healthy food and sinful temptations to enjoy at the HTB. We were well looked after by the staff. Our TONKAWA tables were reserved and the dishes were quickly cleared away to make room for new selections. Some guests and members came much later in the afternoon and stayed into the dinner hours for steak, ribs brisket and baked ham. Familiar faces in the food line are: Randy Edmonds and his wife Bonnie, Gwen Cooper, Mary Oyos, Vicki Gambala, Paula Brim, Carmella Ignacio, Perse Hooper, Juan Castellanos and his son Joaquin. There were over forty TONKAWA members and guests attending but you can enjoy recognizing many from the images included. Of special recognition and honored with flowers and a gift are Jane Dumas, Nellie Ruiz and Roy Cook. We thank you all for your generous thoughts. 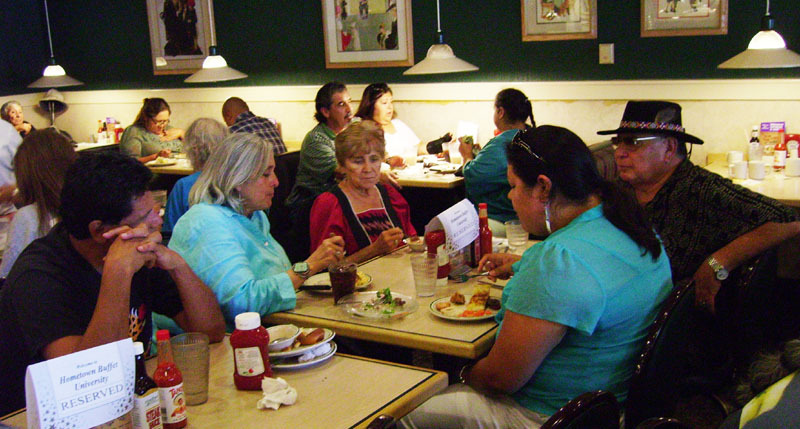 This is certainly a festive summer of fine fare and friends, gatherings, picnic, dance classes and this TONKAWA Elders luncheon, just wonderful to be alive!